Westmead Centre for Oral Health forensic odontologist Associate Professor Chris Griffiths (third from left) with international delegates at the forensic odontology course in disaster management. For most people the thought of identifying human remains by examining teeth is gruesome and is often the result of a fatality or crime. This is not the case for Westmead Centre for Oral Health forensic odontologist Associate Professor Christopher Griffiths who recently shared his expertise and knowledge with international students at the forensic odontology course in disaster management. Prof Griffiths has worked at Westmead Hospital in this speciality and unique field of medicine for more than 30 years. “It was a privilege to share information with dental officers from the military, health and private practice the skills required for positive victim identification,” Prof Griffiths said. “In this day and age we are all aware and concerned about the possibility of a natural or planned disaster. Associate Professor Chris Griffiths has a gruesome job that he is very good at. “Forensic work is often complex and performed in stages. Identifying people by their teeth is just one component of these stages. 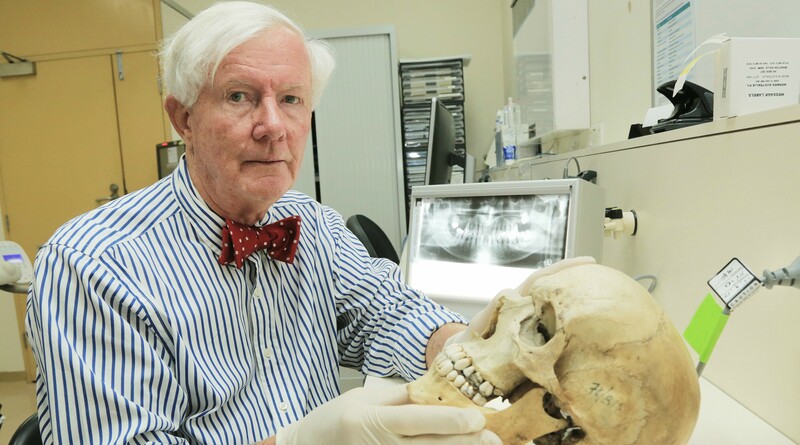 “During the 2002 Bali bombings and the 2004 Boxing Day Indian Ocean tsunami in Thailand 60 per cent of the victims were identified with dental evidence within the first two weeks while some of the more difficult cases were identified through DNA,” Prof Griffiths said. Chris was the first scientific vice chairman of Interpol’s disaster victim identification committee where the international community agreed that finger printing, dental evidence and DNA extraction was the primary stand alone identifiers.